ACRLog welcomes a guest post from Steven Bell, Associate University Librarian at Temple University, and founding blogger at ACRLog. As academic libraries of all sizes completed their migrations to online catalogs the librarians looked forward to the removal of the massive catalog furniture, and dwelled on how they would use all the space made available by the its departure. As timing would have it, the advent of the personal computer right around the same time the catalog went away made for an almost natural transition of the space from cards to computers. In my own place of work, where the catalog used to sit one now finds a field of personal computers – all of them hardwired desktops. One also finds printers, scanners and technology assistants to help keep it all running. As my own library embarks on the planning process for a new building, one that will serve the institution throughout the 21st century, the future of desktop computer and whether tomorrow’s student will have any use for this technology is one of many questions related to technology planning. The current wisdom seems to be that undergraduates still prefer to have access to hardwired desktops – even though the vast majority of them own their own desktops or (increasingly) laptops. It would be both questionable and considerably risky to plan for an academic library to open in 2017 without public desktop computing. Looking out into the not-too-distant future beyond that though, perhaps just another 10 years, I believe academic librarians will once again be in search of a purpose or application for all the space created by the removal of obsolete desktop computers. 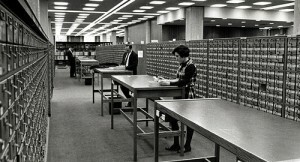 This technology will be just useful in 2027 as the physical card catalog was to the academic library by the time online catalogs were as common as desktop computers are today. There’s no question that today’s college students still expect the library to offer them lots of desktop computers – as odd as that may seem when many of them own their own desktops, laptops or tablets. An article in the December 2012 issue of Information Technology and Libraries titled “Student Use of Library Computers: Are Desktop Computers Still Relevant In Today’s Libraries?” by Susan Thompson of CSU San Marcos, shares the results of two years’ worth of study into student use of the library’s desktop computers. According to Thompson, the students still preferred for the library to offer desktops for a number of reasons with which many of us are acquainted: faster connections; reliability when papers are due; access to onsite printers; preference for leaving laptops at home (this article focuses on a commuter institution); access to special software; fear of stolen/lost laptops; convenience. It’s a conclusion that many of us would expect. But the data was collected in 2009 and 2010. That’s eons ago in the computer age. As I read it I wondered whether these findings would accurately reflect the technology habits of students of 2013 – and would they at all reflect the students of 2027? I know that as I walk through my own library almost every student who is not sitting at a desktop is using (or has nearby) a laptop, tablet or smartphone. Then again, at times of the day students are challenged to find a desktop when they want it. I suspect that we will see some rapid change in student use of mobile computing and that it will, in time, chip away at the preferences identified by Thompson’s research. The future of institutionally supported desktop computing at colleges and universities is one that our IT colleagues continue to debate. Some institutions are abandoning desktops entirely while other swear on the value of offering acres of desktops and laptops to go. Factors such as residential vs. commuters, socio-economic status of the students or the local technology culture can all impact on the need for desktop computing. In an increasingly BYOE technology landscape, it seems inevitable that students will have no real need for a library provided desktop. That appears to be the thinking behind the planning of the Brody Learning Commons at Johns Hopkins University. It offers access to great study and learning spaces with technology support – but no computers are provided. Then again, they are nearby if needed in the familiar confines of the attached Eisenhower Library. Perhaps the best thing we can do, in planning for onsite library computing today, is to aim for maximum flexibility. Students may express a demand for desktops today, but it’s hard to imagine that will be our future. When we gaze out upon our fields of computers we should, in our mind’s eye, envision it as a room that holds nothing but an enormous, as far-as-the-eye-can see card catalog. Because, ultimately, as the next generations of students make it to our doors, it is less likely they will expect us to provide them with computers, and it may be that they would consider such amenities laughable and a waste of their tuition dollars. It is a bit premature perhaps, but not unreasonable, for us to begin thinking about how we will use all the space currently devoted to desktop and laptop-loan computers. My crystal ball is less clear on this matter, although I suspect we can always improve things by expanding the café. Does your town still have a video store? Most do not. I don’t mean a Blockbuster or some other big chain store. Those are getting harder to find too. I’m referring to a small, independent, niche type video rental store. I recall that when movies first became available on VHS the rental stores soon began popping up everywhere. At first they were all independent, like individual bookstores with unique personalities. Then a few local chains sprouted up. Then national mega-chains started to dominate the landscapte, and with their lower prices and quantity they pushed out many of the smaller independents who had no way to compete on price, selection or convenience. It is all reminiscent of the retail evolution from mom-and-pop grocery stores to Wal-Mart. The independent stores were usually much beloved, and as when long-time bookstores finally close, it makes the news. No doubt, public libraries, with their free videos, help to put a nail in the coffin, but nothing comes close to the spike delivered by Netflix. As it masters the art of streaming video to all devices, Netflix tightens its grip on the video rental industry even as its recent price increase has customers griping loudly. As the dominant player in its industry, Netflix is now every competitor’s number one target. Despite the overwhelming odds against success as an independent video store in 2011, a few are actually surviving if not exactly thriving. What these survivors are doing could provide a lesson for academic libraries that face similar challenges in a world where our target population can find information elsewhere with greater ease and convenience. In an NYT article titled “Video Stores, Reinvented by Necessity” we learn these strategies include participative film viewings, presentations by filmakers, film classes, trivia nights and yes, better facilities. I especially like that the core of these strategies is based on trying to compete with giants like Netflix and Internet-delivered video by focusing on the community and the building of better relationships. As one store owner said “What we should be focusing on was community and people talking to each other,” Ms. Polinger said. “We just wanted to go the other extreme and be more interpersonal.” This resonates with me because I’ve been emphasizing the importance of relationship building to capitalize on an experience we can provide that our community members cannot get with those nameless-faceless-corporate Internet providers of information. Another lesson to learn is that personalization makes a difference – and that being different is a competitive advantage. Another independent store owner proclaimed that “People who work in the video store are very knowledgeable about film. There’s always a conversation, not just a click. Those kinds of real experiences, you can’t really duplicate when you’re getting a movie out of a vending machine.” That sounds vaguely familiar to personal reference services in a library. What’s different is that academic librarians often approach these interactions as simple and forgetful transactions when they are opportunities for a conversation. Every academic librarian’s goal should be to provide a better experience based on personalizing each transaction. We do not help ourselves by simply pushing out more content – even if we allow our community members a more personal role in choosing it. Given the size of our staffs and number of potential users we’ll likely never have the capacity to reach all of them – and many of them are not interested in what we offer. That was a major lament expressed by Bohyun Kim in her ACRLog guest post when she wrote “users prefer not to be mediated by librarians in locating and using information and resources…So where do research libraries and librarians go from here?” While we would never want to intentionally abandon any segment of our communities and we will always promote our openness to all, the place to go, I think, is where we put our energy into connecting with the segment that has the capacity to become passionate about using the library. Create the programs, conduct the activities and build the relationships with those who do care about the library. I’ll paraphrase what Simon Sinek says in his book Start With Why (and in his TED Talk): “The goal is not to push your services to everyone who potentially needs what you have – your goal should be to focus on the people who believe what you believe.” That, Sinek tells us, is how you build loyalty and increase the likelihood that your loyal customers will tell their friends how great the experience is at your library. That’s exactly what those remaining, surviving video stores are doing. Just as with other industries that are being displaced or disintermediated by disruptive innovators, newspapers, travel agents, music delivery, bookstores, higher education, there are lessons that academic librarians can learn from those who survive when all others are becoming irrelevant, marginalized and obsolete. There’s only a crisis in academic librarianship if we let it happen. I had two jobs before I started my first academic library position. Going through library school I was thinking special libraries. I never really thought much about academic librarianship as a career option. The prospects of working on more in depth research projects for others appealed to me. One of the special library jobs was in a nonprofit, but the other was corporate. Both were good jobs where I learned lots of useful skills, and worked with exactly no other librarians – but many other interesting colleagues with diverse professional backgrounds. As I became more professionally active in local associations I got to know a few academic librarians. I really liked the ideas they were sharing and the work they were doing. It became more clear in my mind that working in a one-person library setting was inhibiting my professional growth – I wasn’t learning from library colleagues nor was there any advancement opportunity. The possibilities of being engaged in the teaching and learning process began to carry greater appeal than performing the research for other professionals, however challenging it was. I started applying for academic library positions, and was frequently rejected. I had absolutely no experience working in an academic library. Eventually, thanks to the business research skills I developed in my corporate special library job, I was able to make the transition to a business library at a research university. I’ve never looked back. What about going in the opposite direction? I actually cannot recall even a single academic librarian who has left academia to transition to a position in a corporate library. I’m sure it happens more often than we know. An academic librarian could get burnt out on dealing with students and faculty. He or she might decide to get off the tenure track, or tire of dealing with library co-workers. A forced relocation may take someone to a town where the only opportunity is in the corporate sector. And yes, corporate/special library positions often have higher salaries. There are any number of reasons why an academic librarian might want to go corporate. As with most lists of pros and cons, someone’s “pro” is another person’s “con”. I don’t see the need to publish as a drawback in academic librarianship. If you like to research and write, share your ideas, enjoy the rewards of publications, etc., it’s great to be in an environment that supports and potentially expects you to publish (bear in mind that approximately half of all academic libraries have no tenure or publishing requirements, so if you don’t like the publish or perish environment it can be avoided). The work environment also comes up here. Do you like to work with other librarians or would you rather be a one-person librarian? No one mentioned the potential advantages of working with a group of non-librarians. I always learned a great deal from the social workers, fundraisers, planners, marketers, tech wizards and other non-librarians I worked with – and in academic librarianship we get to work with many non-librarian colleagues in student services, residential life or administrative services. What would I add? For me a pro of academic librarianship is tuition remission and access to further education. I would never have earned my doctorate had I stayed in the corporate world. Not only did I have access to a program right on my own campus, but the bulk of the tuition was covered. Corporate librarians could counter that by suggesting one doesn’t necessarily need advanced degrees in their world (although a business librarian in the corporate sector can certainly appreciate having an MBA). And let’s not forget tuition benefits for children and other family members. With the cost of college today, tuition support for family members is a fantastic benefit, and almost worth putting up with any “con” of academic librarianship. I am aware that many corporations do offer tuition reimbursement to their employees, but I suspect the number that help pay for dependents’ education is quite small. Although this conversation focused primarily on going from academia to the corporate world, I’d suggest that academic librarians seeking to transition out of higher education think of it as academic versus special. Most of the “pros” for corporate librarianship apply to nonprofit sector special library positions. This is a good option for those who might want a one-person library position that doesn’t require going corporate – or the need for business librarianship skills. Of course, I hope academic librarians will always seek to stay committed to a career in higher education, but personal goals change and sometimes life’s circumstances require us to shift career paths when we least expect it. So what pro or con would you add to these lists? And just for the record – I have never worn jeans to work.